This project was the product of a series of workshops hosted by Continuum Innovation at MIT Sloan. The workshops focused on the design thinking process as practiced at Continuum and sessions were structured to teach specific tools used in the service design and strategy services offered by the company. The project was hosted by a the 100 Main Street Cafe, who presented me and my team with the challenge of improving efficiency at the cafe. As a team, we observed and interviewed cafe users and staff to gain critical insights and develop user personas; we met with cafe managers to understand needs and constraints; we identified pain points in the use experience and overall system drivers; and we developed and prioritised concept solutions. Our final product was a presentation illustrating our process and our proposed solutions, as well as the current and ideal user experiences. An important part of the service design process is mapping the users’ service experience from beginning to end and identifying pain points within the user experience. The tool commonly used at Continuum for this is the Journey Map. 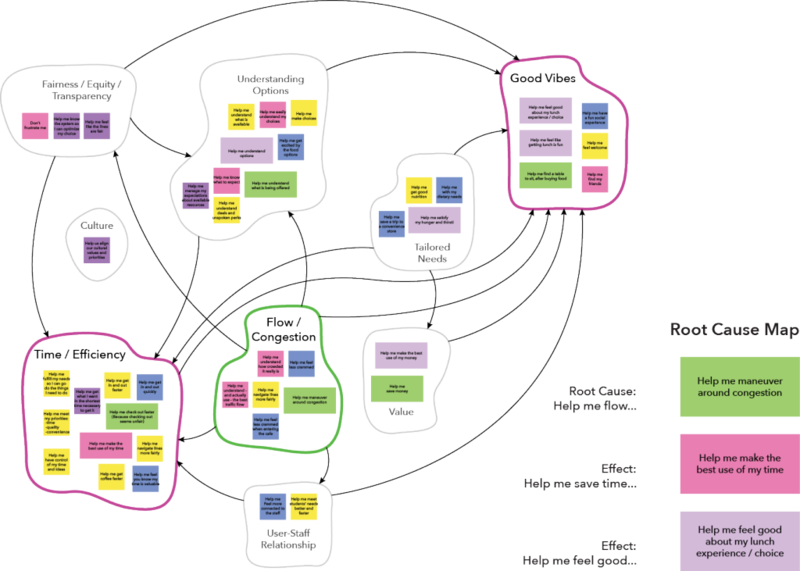 A journey map illustrates the user’s use narrative as a way of capturing a holistic view of the entire use situation. Journey mapping is an important aspect of service design because it is built from true empathy with the user. The journey map at the top of the page illustrates the cafe users’ service experience from arrival and entry, through browsing and choosing, to waiting, paying, eating, and chatting. Mapping out the user experience through observation and interviews helped us to understand that the pain points as indicated by the consumers were the time spent waiting in the line to pay and a sense of unfairness the arose from the informal nature of the current line forming structure. The users also let us know that they appreciated the high quality and wide variety of food options that the cafe provided, along with its convenience for their schedule. To further understand how the current design of the cafe experience might be contributing to the users’ pain points, we brainstormed a series of help me statements and organized them into categories. We charted the relationships between these statements to identify the root cause in the system. In this case, we identified flow as the primary issue in the cafe design. The major effect that issues of flow were having on the use experience were negative effects of perception of waiting time. Upon identifying the elements as the primary drives for this project, our team brainstormed ideas about how to improve the flow in the space. Our ideas ended up fitting into four main categories : Spatial Layout, Payment, Engagement, and Reaching Out, We prioritized our list of solutions given the client’s parameters, we identified the solutions that fit together to describe the our ideal future scenario, and we back-casted from this ideal scenario to identify solutions that could be implemented in the short and medium terms. The adjacent diagrams illustrate the current scenario and the short-term solutions. The current scenario diagram illustrates the flow issues created by the current spatial system. There is a “main entry” to the cafe located to the east, but due to current arrival patterns this entrance is rarely used. Instead, most cafe users enter from the south. This area contains two bulky cashier stations that restrict the flow. The outcome is that there is bidirectional flow of entering and exiting users through a space that has limited room for maneuvering. This is the tension in the system that our solutions work to resolve. The short term solution illustrates an entry gate that redirects traffic flow and a minor location change of some of the snack items located near the cash registers. The entry gate is envisioned to be temporary and adjustable (think movie theater ropes) and to be put up during peak volume times . This small change would work to redirect traffic flow into a single stream through the main entrance, into the cafe and through the payment experience. The snack items were moved to an open area in the back of the cafe to reduce perceived clutter from the bulky cashier stations and to be near customers while they are waiting for their other food items to be prepared. These simple solutions could help to reduce the congestion at the cafe during peak hours. The medium-term solution reduces congestion by separating payment traffic streams and creating a satellite station for coffee services. This solutions envisions a separate cart or station for coffee sales that is separate from the cafe. This helps to reduce congestion in the cafe by removing a payment stream from the program and transitions from four check out stations down to two. This solutions has the added benefit of bringing the cafe to where its customers are. By setting up a satellite coffee station elsewhere in the forum or in another building, the cafe can offer coffee to students when they are moving between classes without forcing the to enter the cafe. The long-term or lighthouse solution illustrates a change in user flow and a reduction in congestion by changing the way that cafe users pay. This solution envisions the replacement of the bulky cashier stations with mobile cashiers with hand held payment processing devices. Because there are several food options that allow customers to pay by the pound, and because food is currently weighed by the cashier upon checkout, this new payment method would require a rethinking of the weighing situation. To solve this problem, we proposed to have the cafe users do some of the check-out work themselves by setting up weigh stations that allow the user to weight their own food. A slip with a bar code would be printed out at the weigh station and the customer could then find one of the roving cashier to complete payment.